When Scottish singer-songwriter Edwyn Collins suffered a cerebral hemorrhage in 2005, his movement became restricted, his memory was lost and his speech became limited to four phrases that he repeated over and over again: “yes,” “no,” “Grace Maxwell” (the name of his wife) and “the possibilities are endless.” There was little chance of him getting his health back on track, let alone restarting his career, but that last phrase in his small vocabulary proved to be prophetic. With the help of his ever-caring wife and son, Edwyn gradually began to piece his memories back together, took on painting and slowly began to form new sentences again, recalling and even singing his old lyrics. Edwyn’s story is a tear-jerker and, packaged in a documentary film titled, aptly but unimaginatively, The Possibilities Are Endless, it raises red flags for audiences averse to emotionally charged collections of heartfelt talking head interviews so prevalent in documentary cinema. Fortunately, there is no sign of that in Edward Lovelace and James Hall’s film, an astonishing work that subverts all expectations of formal construction, while painting an empathetic and incisive portrayal of the singer’s life. In tracing Edwyn’s process of regaining his memories, the film adopts his point of view, manufacturing a sensory experience akin to his perspective of interacting with the Scottish landscapes of his home. Sleekly photographed and expertly cut, Possibilities combines archival footage on grainy film recordings from Edwyn’s life with digitally shot, haunting images of the misty highlands and recreations of his youth starring his son. The framing breaks Edwyn’s current state into fragments, focusing on the empty spaces as he stares off into space and picks up details that others dismiss. 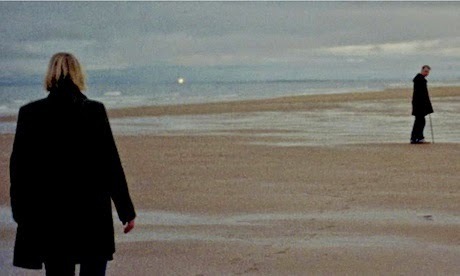 Then it reverts to expansive long shots of his hometown and the eerie presence of the calm seaside. The film is strictly defined spatially, but paradoxically, the empty spaces and the frightening sameness of nature embody Edwyn’s struggle to place his past. It’s a hypnotic experience, and an utterly heartbreaking one. It’s difficult to hold back tears as we watch Edwyn fail to recount simple anecdotes, mistake numbers and memories for one another and remain helplessly passive in a studio he had once built. Possibilities does a brilliant job of immersing the audience in his struggle, making his gradual liberation all the more meaningful, but it does so by avoiding sentimentality. The audience is invited to live Edwyn’s experience and ruminate on his surroundings. The resulting experience is almost spiritual, one that leaves the audience thinking differently about life itself. The struggle we witness is all Edwyn’s, the catharsis is ours.